With the Chinese New Year coming up in two weeks, it’s good time to look back on the martial arts scene in China and see what happened in 2014. China is a battleground for various MMA promotions and the region has scene a marked uptick in events, gyms, and fighters with promise—but the most populated nation in the world still hasn’t produced any breakout stars. The China market is drastically underperforming, especially when compared to tiny nations like Ireland that can move the needle with one show and one man. Nevertheless, there’s been some progress. 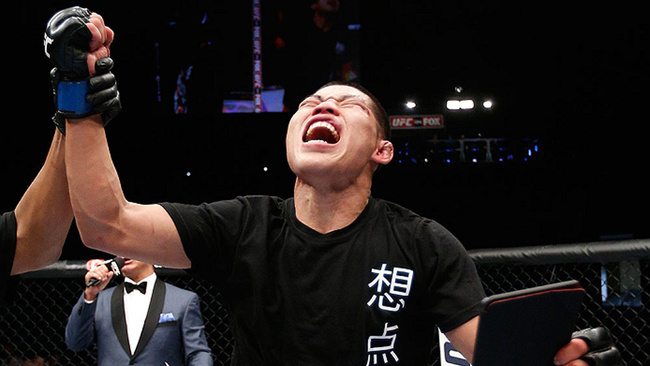 First and foremost would be the arrival of China’s second generation of MMA fighters in the UFC. Of the first four guys to break out of the Sanda circuit and into MMA, only Zhang Tiequan made it to the Octagon, and his contemporary Ao Hailin only made it as far as the coach of TUF: China’s Yellow Team. Their students, however, are taking up the torch. Li Jingliang has had two fights with the UFC out of China, winning a close one over David Michaud and losing another close one to Nordine Taleb. He has some great coaches in his corner, and he is currently China’s best prospect. His compatriot Zhang Lipeng has also had two post-TUF fights, winning one and losing his most recent against Chris Wade. He has the talent and a top coach in Scott Sheeley, e’ll see if he can turn it around in the third fight and continue to long march forward. I personally am looking forward to Wang Sai’s next fight in the UFC. He’s one of the more aggressive fighters to come out of China and he is known for heavy hands and a big heart. He and Ning Guangyou are a bit older than the two fighters mentioned above, and could make waves with their KO power and aggressive nature. And that wave-making Chinese fighter could come out of the OneFC, now the only big name promotion to hold an event in Mainland China. After RUFF faded away (RIP gentlemen, you did good while you could). OneFC filled the void with some great shows around the Pacific Rim (Reign of Champions for example, where Malaysian Ana Osman made her mark) and a big one in Beijing just before year’s end. The Beijing card was weak, and didn’t attract much attention outside of the fact that it was held in Beijing, but there were some young Chinese fighters on that card that we might hear about later. Big news in China would be the explosion of MMA-esque events after regulations that restricted who could hold sporting events were relaxed. Since then, regional promotions have tried to cash in on the bonanza, to the point that Thailand’s expat fighter community is being sapped dry. If you are an MMA fighter and want to travel to China, there are a few (somewhat shady) promoters looking for you. The demographic at these events can be quite eclectic: Mongolians, Khazaks, Tajiks, Koreans, Thais, North Americans, Brazilians, Filipinos, Africans... anyone who can put on gloves and put on a show is welcome. UFC Macao the second time around was a pretty big show, featuring Cung Le again, this time losing in brutal fashion to Michael Bisping. Ronda Rousey and Dana White were in attendance, and the fights weren’t quite as entertaining as the first Macao show (where Le KO’d Franklin), but it’s a step forward. The reshuffling of the UFC’s international division started right around this time, with Asian director Mark Fischer getting the axe. No one has yet to fill that position, but expect some news soon, as the season for shows in China starts up again come the spring. Will the real ambassador of Chinese mixed martial arts please stand up?